DH and I have been travelling to surrounding towns on our days off and doing some exploring. On a recent trip to the town of Esk I picked up some lovely things.... an old perfume spray bottle that sits nicely on my bedside table and a soft and pretty companion cushion to go with the one Elaine made for me when I moved. There are five windows in our main living area and the blue curtains that were behind my couch were irking me every time I looked at them so I decided to hang a quilt over the window. I think this is much more pleasant to look at don't you? Beautifully Quilted by Elaine from Quilting in the Vines! And finally, in the finishing off mode that I am in, this block I designed a few years ago when teaching a needleturn class made a lovely cushion for my armchair. The extra fabrics needed have been selected to compliment the fabrics in the range. Unfortunately I was only able to purchase enough fabric for 8 participants so if you have already signed up for this it won't be long before it will be heading your way! The new Dual Purpose templates are for cutting your fabric. You then have the choice to Hand Piece, Machine Piece or if you prefer you can English Paper Piece. Pre-cut papers are available for each shape with the exception of the Large Triangle in which case you will need to cut the 4" squares in half diagonally. 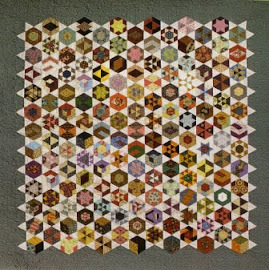 'Trick or Treat' is a little hand appliqued basket quilt in Barb Adams and Alma Allen's book 'When the Cold Wind Blows'. I started stitching my baskets a few years ago but haven't looked at them for a while. A visit from my friend Sheridan prompted me to pull them out again. Sheridan has finished piecing her top and is in the process of hand quilting it. As well as hand appliqueing the baskets and leaves, Sheridan decided to hand piece the squares together as well. It's absolutely gorgeous. I laid my squares out and counted them.... still a lot of baskets to do. Do you like my idea for a large basket in the centre or should I stick to just the little baskets? I have a large stash of cheddar fabrics now, plenty of choice for zinger fabrics in future scrappy quilts. I think I might have too many handpiecing projects on the go at the moment..... must make sure I don't start any more until a few are finished! It has turned bitterly cold here in the last couple of weeks but we are heading to the Gold coast for the weekend and I am hoping its a bit warmer there. I am taking my applique with me. I have attatched the striped border with mitred coners around the centre applique and marked in the scallops. Now I need to applique them. Then there needs to be about 6 more birds placed in the gaps. I probably won't get anything done but I always take some handstitching with me just in case!